Karl Zuehlke (KZ): Dear Martin, there is something I cannot quite quantify about how you put words together into such solid lines. I don’t know that I want to know. Your lines and sentences justify themselves somehow in my mind; as a reader I love the precise cuts through the flesh and fabric and time and being. Would you please talk about how your voice evolved, how it solidified into Dear Mark? Martin Rock (MR): I feel like each poem dictates its own voice, and as a poet I hope to be always evolving rather than evolved. But I’m glad you think of “flesh and fabric and time and being.” A more direct way to answer your question might be to give a list of poets who have influenced me, but I know I’ll inevitably leave too many out. I try to read across schools and time-periods and cultures. I don’t pretend that reading a work in translation is equivalent to reading the original, but the collaboration between translator and poet can provide invaluable whispers, and helps me break away from familiar tropes. And of course the ‘real world’ also exerts its influence. I like Stevens’s idea that “the poet is the priest of the invisible” & I think the invisible carries its own voice. “There are two of us in the room. Standing in front of a painting divides the viewer from the artist by a stretch of canvas, the nails holding the canvas to the frame, and time. The painter was there, and there are traces of that presence in the paint. Similarly perhaps, we could view these poems as a record of that interaction? There is a record of Martin Rock in the poems, that we can find in the words? MR: That’s an interesting thing to think about — the conversation that happens between artist and viewer. You call the paintings “symbolic environments” but I try to be mindful of their physical nature when I’m in front of a canvas. To look at brushstrokes up close and see the materiality of paint or the texture of the canvas beneath it evokes the artist’s physical presence as well, absent only by time. In the same way I’ve convinced myself of the presence of ghosts in shadow, I’ve felt the artist standing behind me when looking at a painting. I imagine these poems contain something of me in the same way a canvas contains its artist, but I don’t think they’re complete until they’re read and assimilated. In “Tradition and the Individual Talent,” Eliot suggests that a new work of art modifies all the “existing monuments” that came before it. I hope these poems enter into the kind of genuine communion of which Eliot speaks. The poem you’ve quoted here was the first poem of the project. In 2010 my friend Brian Trimboli put an image of “Serigraph, Acrylic on Paper, 1968” on the TV we’d set up as a computer monitor. Though I don’t often smoke pot, that night I had. I remember feeling as though I was reeling in psychic matter from another dimension and trapping it, ghostbuster-style, in my poem. It upsets me that our culture allows the acknowledged use of psychoactive substances to deny verity to a perceived experience. But it’s important that I mention I came to this project while in an altered state, and that Rothko’s work has a quality that returns me to that state without the need to alter my brain chemistry exogenously. I think Rothko is one of Longfellow’s Promethean bards who travel outside the realm of typical human experience and bring back a piece of that world for the rest of us; this is one reason his paintings are sometimes referred to as portals or doorways. The chapbook was written with this kind of psychonautic questing in mind. If Rothko has mined some spiritual quarry in the creation of his art, my work is an attempt to seek out those echoes and filter them through the lens of another consciousness (my own) and another medium (poetry). KZ: You might have created an echo chamber of your very own. Also, I am fascinated that Dear Mark developed as an aftereffect of a collaboration between yourself and Brian, whereas your first chapbook Fish, You Bird was a more direct collaboration between yourself and Phillip Ischy. In some respects Dear Mark is also collaborative: the book’s title suggests apostrophe as the heading of a letter addressed to Rothko. While you do draw on any number of sources, the poems you write retain their own integrity. They compose a surface that intersects with the work of another but that is not dependent on it. Perhaps you could talk a little about your process: how much of your work is inspired by collaboration? How do you maintain that balance between your own work and your inspirations? MR: I wouldn’t say Brian and I were collaborators except in the way that friendship is an act of collaboration. He did provide the prompt, and without that I never would have written the book. That said, Dear Mark is collaborative in that it is ekphrastic. On the other hand, Fish You Bird was a collaboration with Phil completely. We wrote those poems between Texas and Japan and New York over the course of about 6 years, each as a response to the previous in an approximation of the renga-jo, an ancient Japanese form. For more info about that project, here is a link to our interview with Traci Brimhall at her collaboration blog, We Are Homer. I hope to someday see all 100 of them published, as Pilot published a selection of 18 to fit the form of the accordion-fold chapbook. I also want to acknowledge the work of Betsy Wheeler and Meghan Dewar who put beautiful and important books into the world with their press, though it is now defunct. With allusive and ekphrastic writing, as soon as a poem relies too heavily on its source it becomes like skin that isn’t wrapped around anything. This project is an attempt at a representational recording of the mind engaged in nonrepresentational art. That said, I hope the paintings are not necessary to the function of the poems. Because many of Rothko’s titles are repeated, I’ve provided a visual diagram as well; anyone so inclined would be able to unite each poem to its corresponding painting. The line drawings are there to add some aesthetic variation and to act as a kind of scavenger-hunt guide. Seeing the images represented in the poems may be achieved with a simple focusing and unfocusing of the eyes, or it might require a subtle change in the way you perceive the world. With the diagrams I tried to create an image that is devoid of color, as is text, though they signify paintings that are almost pure color. KZ: I was lucky enough to once read all 100, and I would love to see them bound and stitched into a volume. You succeeded I think also with your most recent project. Good ekphrastic poetry expands the world of the image, but great poems written about art take over that world. I am consistently impressed by the capacity of your poems to exist independent of Rothko’s paintings and yet originate from them, to activate a surface and yet imagine it completely in your own mind. How might you respond to those that fear collaboration might stifle their creativity? MR: I guess I’d suggest they don’t collaborate. I’m not flying any banners here. But artists concerned about guarding their creativity as though it’s some kind of rare and delicate animal might find that it actually prefers to be part of a phalanx, or colony, or swarm. I’m all about inclusion rather than exclusion. If something works for you, great. If not, don’t do it. KZ: This question is about your poem “No. 9, Dark over light Earth, 1954,” which appeared in The Bakery, and in which you write, “It seems you view daytime as heavier / than night.” It seems to me that much of your collaborative approach is based on empathy: the record of your thoughts about the art someone else produced. Is it your capacity for empathy that allows you to create something of your own from this process, or do you find yourself conflicted? MR: That line owes a lot of its existence to the poems of Shuntaro Tanikawa, a living Japanese poet I admire who has written about the density of daylight that blocks our view of the rest of the universe, or at least that is my interpretation of his words. I really think all poets and lovers of poetry should seek out his work. There are a few out-of-print books of his in translation. He’s amazing. I also think it’s interesting what you’re saying here about empathy. I certainly try to be empathetic in my dealings with other living beings and in my approach to art—and I attempted to tread lightly when dealing with Rothko’s life in this chapbook because I wanted the book to be more about his art than about his terrible death—but I wouldn’t have thought that recording one’s own reaction to art or revealing one’s visions could be an act of empathy, though I suppose it can. I also think it is important to distinguish between what I consider to be ekphrastic writing, which can be, as you describe, a record of thoughts based on the art of someone else, and what I typically think of as “collaboration” which is created when two or more people join together intentionally to create a new work. It is impossible for me to know what Rothko would think about Dear Mark, for instance, or if he’d even have wanted the book to exist. KZ: I think sustained reading, whatever the medium or genre, is at its most reducible an act of empathy. Sure, you can stripmine a poet’s style, or read for any number of other reasons. I guess I just can’t imagine any motive besides empathy fueling me to read the complete works of any given author. And for me that spills over into my reading of any book that sustains me, as yours does. You do treat Rothko’s work fairly: that is what I love about these poems, and what I was aiming at with the word “empathy”– a sort of respectful distance and equilibrium. I do not think empathy and altruism are the same. MR: It’s funny that you ask about the golem. You’re definitely not the first to ask about that obsession of these poems. 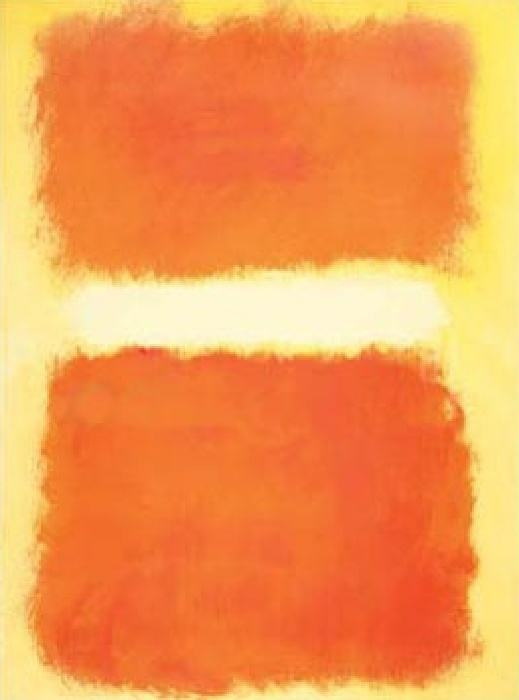 It’s like this: some of Rothko’s paintings look to me a bit like large rectangular faces, or even robots. I found that the word robot derives from the Czech word for “forced labor.” The intersection of my interest in folklore, Judaism, and the history of robots led me to the golem, a being formed of mud in Jewish folklore and also a particularly apt metaphor for the spiritual nature of art. The fable is that a Rabbi molds mud into the shape of a man and writes the word “truth” on its forehead to bring the golem to life and do his bidding (golem in Hebrew means “unshaped form” or “uncultivated person”). When the Rabbi is through with him, he can cross out the aleph in the Hebrew word for “truth” to change that word to “death” and the golem returns to lifeless mud. I love this capacity of language to create and end life. It harkens back to a time when it wasn’t preposterous to suggest that words carry mystical power. A lot more people on earth than you might think still believe this. After all, in the beginning was the word, if that’s your jam. In many of the stories the golem grows a bit too big for his britches and becomes incredibly destructive. I started to think of Rothko’s paintings in this way. They were created and given life in that they were brought into existence. They continue to exist, though their creator is no longer present (and thus cannot end them). They consumed him, to the extent that he ended up serving the paintings in some ways rather than the other way around (though of course they continue to serve him). They also have a quality of beckoning, and of sentience. I decided to give voice to that in the poems. I started to get a sense of an intelligence behind the paintings that shapeshifts from one to the next. I also found that thinking of the paintings as sentient opened up a lot of possibilities for interpretation, and allowed the poems to wallow in that same ambiguity between the painter, the wall, and the viewer. As a side note, the story of the golem fits closely with the story of the origin of the second race of man in Greek mythology (the first made too much of a mess of the earth and were dashed from existence by the gods). In the myth of Prometheus and Pandora the remaining two humans after the flood are told by the oracle to “depart from the temple with head veiled and garments unbound, and cast behind [them] the bones of [their] mother” (from Bullfinch’s Mythology). Not wanting to defile their family members who’d just died in the flood, they picked up stones instead and threw them, and from each stone grew a new human. I love the thought that modern humans are descended of the earth, but also that we were planted here (as in the notion of panspermia). I also get a kick out of all the correlations between myth and contemporary religious dogma and our culture’s ability to see one as absolute truth and the other as mere storytelling. So much of truth is context. Sorry for the digression. KZ: I love digressions.The painter, the wall, and the viewer: that too is spot on. In “No. 1, Black Form, 1964” you consider color theory, and in particular the use of black and Kandinsky’s approach. You take this theory as a subject. In what way has visual art affected your poetry? MR: I don’t even remember how I first came across it, but at some point I read the line “Black is like the silence of the body after death.” Of course it had to end up in a poem about one of the black paintings, and I began that poem with it. I’m glad I didn’t fully discover Kandinsky’s color theory until after the chapbook had gone to print (not that it is possible to fully discover it ever) because it would have been a very different book, and I might have had to title it Dear Mark and Wassily, which doesn’t have the same ring to it. The poem you mention attempts to look at the relationship between the nature of the color black and the nature of language. Black is the non-color and the every-color; it is made of all others, and thus consumes them, hides them, contains them. Language, I think, does the same thing with matter. We name a thing and trap it in between corporeality and theory. The naming of an object hides it from us in our attempt to acquire it. At some point in the project, I began to imagine that the paintings were snapshots of post-apocalyptic (or more accurately, post-material) futures — yes, as well as sentient robot-golems — and this poem was an attempt at imagining a future in which the “false objective” of immateriality (possibly Buddhist in nature) had been reached, though, what then is to be done with language, or rather what is it to do? Kandinsky’s color theory separates color from the objects it adheres to, which is a beautiful way of thinking about a post-materialist world. “Made real / by their reconciliation to flatness” is in some respects a good way to think about the development of your poems in response to Rothko. I also admire the development of this poem, in that it confronts and transgresses borders and surfaces, and in so doing, evokes an emotion common to our time of navigating images as a mode of being. In capturing the movements of your mind in these poems, you act out in its complexity a state of being pervasive due to the internet. How much trimming and revision did this poem take, relative to others in the collection? And by extension, how much of your process is revision? KZ: Lowell really captures that emotion. I am curious how you orient yourself in terms of another tradition, the one set by the New York School, a great number of whom were established art critics? MR: That’s a good question, and one I’d rather not give a direct answer to. I don’t like to think I am oriented toward any one school or another. I feel equally influenced by ancient Japanese poetry (or at least the translations I’ve read) as I do by any one school in America. I love the work of Whitman as well as that of Robert Hayden & Sylvia Plath; I feel equally attracted to and influenced by translations of Rilke as those of Borges. I am fascinated by both surrealism and transcendentalism, formalism and “experimental” writing. To claim allegiance to any one school feels false to me, so I won’t do it. That said, I’ve been lucky enough to spend time with John Ashbery on multiple occasions at NYU, and grappling with his work and hearing him talk about it has influenced my own. From the New York School I celebrate the use and manipulation of form as generative, and the immense amount of cross-media collaboration. Poets and artists and musicians all breathe the same air (and so do bankers and business-owners and security advisors). But I also feel that too much influence from the New York School can lead to poetry that turns to irony as a way of avoiding sincerity, and while I appreciate the tradition I don’t tend to choose that for my own work. KZ: I was hoping you could comment on chapbooks as a form of publication. With so much poetry going digital, your chapbook is an example of just how great it is to have a paper book. I know I am a dinosaur. I like books made out of trees rather than light. I get the sense that paper books have now become a more marginalized medium, but as a result, some smaller presses have been able to publish some gorgeous, understated books. Perhaps I am only inflecting my own bias for the aesthetic object of a book? Perhaps I have not embraced the future of publication? MR: I feel incredibly lucky to have a chapbook out with Brooklyn Arts Press. Joe and Wendy put beautiful books into the world that are meticulously edited and distributed. I’ve read all their chapbooks and many of their full-length books and am really honored to be in such fine company. There are also plenty of other small presses fighting the good fight. As long as bibliophiles are out there (and most poets probably fall under this category), physical books will continue to be made, read, traded, and collected. Chapbooks allow poets to get work into the world without “coming out” in the Victorian sense. They allow a poet who hopes to win a big prize or sign with a big press the opportunity to gain experience in producing a finished product. They also put meaningful art-objects into the world. I’ve been building a pretty great small library of handmade books from presses like Ugly Duckling Presse, Argos Books, Monk Books, Bateau Press, Flying Guillotine, Small Fires Press, No Dear, Organic Weapon Arts, to name just a few. I learned a lot about making books and binding from volunteering at UDP while I lived in New York. I also met a lot of bookmakers at the CUNY chapbook festival. For the past few years I’ve been acting as the editor of Epiphany Editions, where I’ve designed and edited letterpress as well as traditionally printed chapbooks. The most recent series features work by Kimiko Hahn, Darin Strauss, Laurel Nakanishi, and William Kelley Woolfitt. We’ll have them available at AWP and are about to hold another reading period in the next year, so check out the website for more info. Also, I’ll remind you that all books are made out of light. I think there are benefits to both online and print. I like to hold a book in my hands, but I also edit an online literary magazine, Loaded Bicycle and I know that work online tends to get more views than work in print, and it is generally free to read. Whether people are reading the work as attentively I can’t know. I think Lilly Ladewig and Anne Cecelia Holmes did a great job of using the online format to create a project that could not have been done otherwise with their I Am a Natural Wonder blog and chapbook. I guess the way I see it, we should absolutely be pushing poetry in any way we can. If we can begin to edge meaningful language into a landscape otherwise comprised of advertising jingles and politically charged soundbites, mindless pop lyrics and doublespeak, we will have done something worthwhile. KZ: Martin, thank you so much for your time answering my questions and for your poetry. I have enjoyed both. What projects are you currently working on? MR: Thank you Karl. It is always a pleasure speaking (and writing) with you. I’m working with some friends here in Houston on beginning a press collaborative based on the UDP model. I can’t say too much about it yet, but aside from Arte Público, Houston doesn’t really have an independent press and we intend to change that by publishing poetry, translation, text-based art and scores of performance art. Stay tuned for more. We’ll probably start publishing in 2015. I’m also working with Kevin Prufer on editing a book for the Pleiades Unsung Masters series and doing my coursework for a PhD in Literature and Creative Writing at UH. As part of that, I’m working on translating a book of poems by Japanese poet Masato Tomobe. Also, I’m getting married this summer to the woman I love, which will be my best work yet. Martin Rock is a poet, editor, and translator pursuing his PhD in creative writing and literature at University of Houston. He is the author of Dear Mark (Brooklyn Arts Press 2013) and co-author with Phillip D. Ischy of Fish, You Bird (Pilot 2010). His poetry has appeared in Black Warrior Review, Conduit, DIAGRAM, Salamander, Best New Poets, and other journals. He lived in Japan for four years and is poet in residence at Texas Children’s Hospital, where he assists children in the writing of poems and stories. His website is martinrockpoetry.com.